Koh Phangan is often overlooked as a destination for anything but the Full Moon Party. 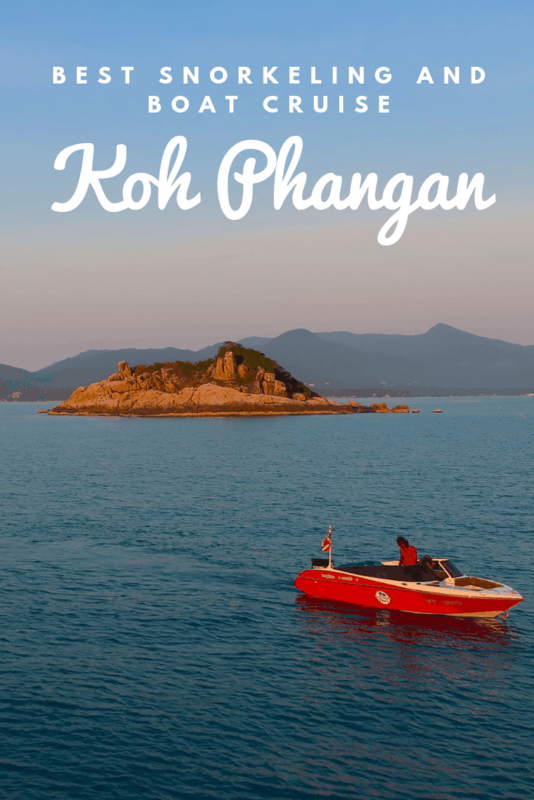 This is such a shame as there are so many things to do in Koh Phangan. One such activity is a Koh Phangan island cruise! While there are a few to choose from, we certainly recommend the cruise we promote in-hostel! It gives you access to Koh Phangan beaches, Koh Phangan snorkeling, Koh Ma Island, stand up paddleboarding, tubing, water skiing, wakeboarding, and even more! As one of the top things to do in Koh Phangan, this island cruise will first give you an amazing view of the island. As you take the trip from the main pier (Thong Sala) to the Koh Ma island area on the northwest side. 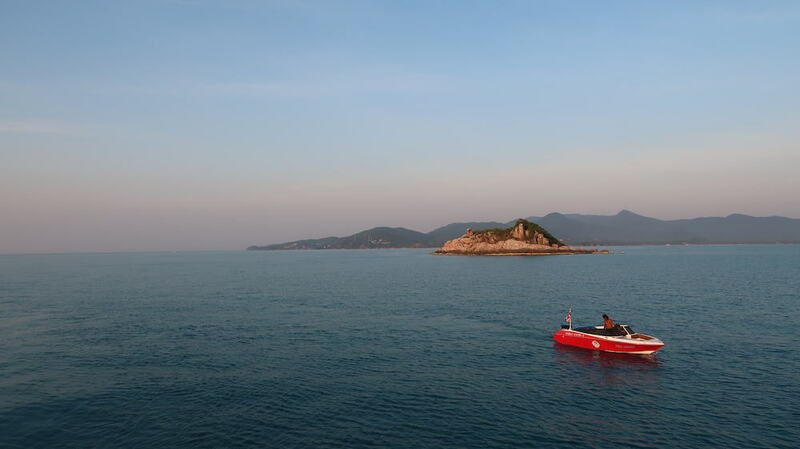 The journey will show both the extensive development on Koh Phangan, which many are unaware of. It will also show the vastness of the island and how much of it is still beautifully untouched. On the other side of the boat is blue ocean as far as the eye can see. During the journey tour-goers can redeem their ticket for a free bucket or indulge at the bar for their drink of choice, should they so choose. During this part of the trip it is common for guests to relax, take in the scenery, and enjoy a casual drink or two. Just before reaching Koh Ma Island, a delicious Thai lunch is provided. Koh Ma Island is known for being the best Koh Phangan snorkeling spot. The provided life jackets and snorkeling gear make the swim leisurely. You’ll take a gander at the beautiful coral and fish below. Perhaps the best part is the realization of where in the world you are. After taking a look at such an amazing snorkeling location, you lift your head out of the water to reveal breathtaking scenery all around you. This island cruise takes you to Koh Ma Island for a slew of activities. Nearly everyone decides to take a dip in the ocean. Jumping off the three-storey boat is absolutely encourage. The level at which you jump from is all up to your confidence. With the highest level being about an 8 meter drop, the bravest guests will flip or dive from the top. The more sane ones will simply jump or choose a lower level. Other activities available are stand up paddleboarding, tubing, water skiing, and wakeboarding. A smaller boat trailing the large vessel everyone is on is responsible for taking guests on their epic adventures. Even if you are not able to water ski or wakeboard, it’s a lot of fun to watch others whiz around the blue ocean water with epic views behind them! Many guests choose to take advantage of the on-board bar and then turn up the music to 10. 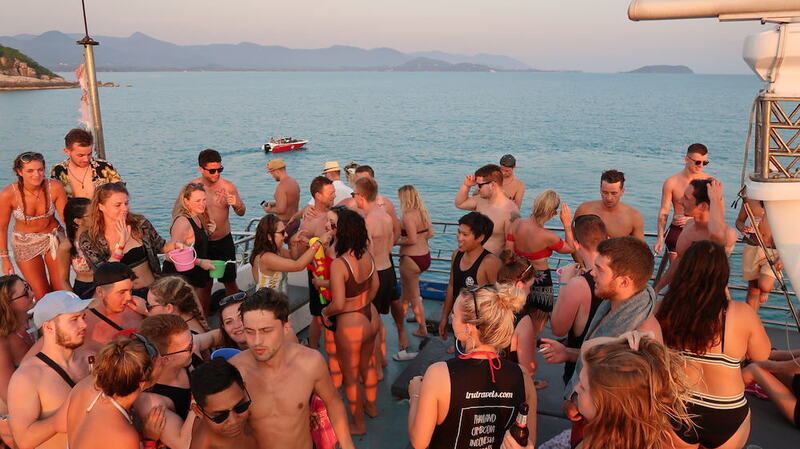 As mentioned before, the first trip of the tour out to the best Koh Phangan snorkeling spot is usually a bit subdued. 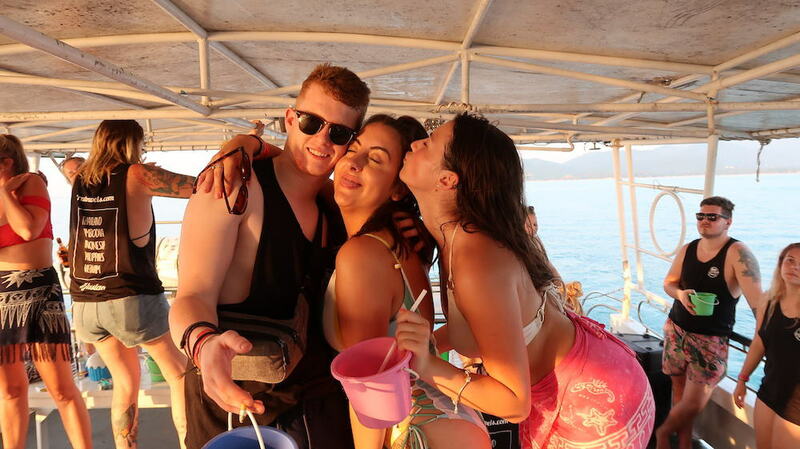 However, after everyone is full from lunch, has taken advantage of Koh Phangan snorkeling, and done other activities, most believe it’s time to crank it up with beers, mixed drinks, or full buckets, the party is on. On board speakers blast the music while guests continue to swim, dance, sunbathe, socialize, or just enjoy the view. Whether or not you choose to partake in this particular island cruise or even stay at our hostel, we at Mad Monkey believe that public perception of Koh Phangan is unfortunately flawed. The vast majority of people believe that Koh Phangan is only worth visiting for the Full Moon Party. This is simply not true. Yes, the parties are fun and an amazing experience. Remember though that the island is full of so many worthwhile activities. Cruises, waterfalls, beaches, mountaintop bars, jungle trekking, bar hopping, and much, much more. One of the best things to do on this island is simply rent a motorbike and just go. Staying on Koh Phangan for 3 nights or fewer and only attending the Full Moon Party is doing a disservice to your stay in Thailand. Koh Samui and Koh Tao (the two surrounding islands) are great in their own right. However Koh Phangan is often overlooked as only a party place. Others’ misconception can be your gain, as this makes the island quiet, tranquil, and serene. This gives you and your friends the opportunity to explore a beautiful Southeast Asian island without a care in the world. As mentioned, Samui and Tao are great islands too. We certainly suggest spending time on both but if time is of the essence, it’s not worth going to each of them just to say you’ve been to all three. It comes down to what you are looking for. Samui will be the biggest and most developed. It will have by far the most people and will be the most touristy. It has things like shopping malls and movie theaters. Koh Tao is the smallest and is best known for diving. Koh Phangan is in the middle of both size-wise. If you’re looking for a touristy vacation, Samui is where you should spend the most time. If you want to dive, Tao is best but Phangan is also offers diving too. If you’re looking for the all-around best island for partying, adventure, and serenity, look no further than Koh Phangan. Looking for even more information about Koh Phangan snorkeling? Then check out these other articles we’ve rounded up to help you!